The following are notes on some themes (principally space and education) in the very engaging, interview-based book recounting the life, struggles, and political and design thoughts of the Italian architect Giancarlo De Carlo, a member of Team 10 who had a deep interest in education from the mid-1940s until his death in 2005. De Carlo is best known for his interest in anarchism, participation and, design-wise, for his work at the University of Urbino but he planned many schools and other universities too and took on debates about problems with education and architecture that few have articulated more intelligently and sensitively. The book is provocative and extremely readable, running along a well-structured thread comprised of interviews between De Carlo and architect and teacher Franco Bunčuga. 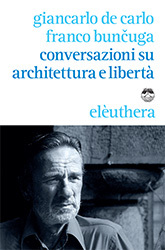 Conversazioni su Architettura e Libertà (probably best translated as “Conversations about Architecture and Freedom”) discussed here is the second edition (2014, after the first in 2000) updated with a new introduction after De Carlo’s death. As I said, these are notes rather than a review but as the book’s not available in English yet and De Carlo’s thinking is refreshing and challenging (and more relevant than ever) I thought it worth posting them. He offers a counter-normative approach to life and designing that might be of interest to others just as education has become narrow, and school architecture too seems to be exhibiting a new international style of orthodoxy. I’ve added some other sources that are available in English at the bottom of the page. The book is a series of conversations with his ex-student Franco Bunčuga and is loosely chronological. It races through his childhood spent between Genoa, Livorno and Tunisia, as a student of Engineering in Milan, a brief period conscripted into the Navy and serving in Greece before, in late 1942, his desertion and subsequent active role in the resistance. Here he leads a troop of anarchist and socialist partisans and, during lulls in the fighting against the Nazis, is reading and teaching Le Corbusier and the new modern architecture to other members of the resistance. Education, how the future might be different and architecture’s role in that remain key concerns for the remainder of the book where, after the end of the war, the pace now slows. We learn about his beginnings in architectural practice through redesigning the interiors of ships, writing for Casabella and other publications, then on to attending CIAM meetings, Team 10, university buildings in Urbino, Siena and other projects. De Carlo has a generous vision of space, of what it is. Space is not a thing and architecture is not the creation of things. At one point in the book he’s describing walking down a street with Ernesto Rogers. They have a disagreement. De Carlo: “For him [Rogers], architecture was about designing beautiful and useful objects but for me it was designing meaningful, suggestive spatial events…” (p. 108) Very often, De Carlo describes architecture in similar conjoint spatio-temporal terms, as an effect or outcome of people’s history, culture and action in the architect’s material realisation. Space is therefore not simply or only a horizontal slice through time but something that changes according to interpretation, something that good architecture can allow, even encourage. However, architecture itself is the “organisation and form of physical space” (p. 125), a definition which helps to see “urbanism and architecture as entwined scales of the same problem” (p. 104). De Carlo is clearly interested in the way an architect’s organisation of space recalls and draws on traditions of organising space and sets up likely future organisations (always subject to people’s reinterpretation) – so there’s an explicit responsibility “beyond” the immediate project backwards and forwards, to architectures and social lives of the past and to those in the future. In describing the shared perspective of Team 10 members: “We rejected the view that the aim of architecture was producing objects, instead we saw architecture’s fundamental job as setting off transformational processes of the physical environment, ones that would be capable of contributing to the improvement of the human condition” (pp. 134-135). He adds, though, that his understanding of Team 10 was much looser than Alison Smithson’s, and not one that he, van Eyck and others completely recognised. Architecture is a necessarily intellectual, political engagement with life in all its dimensions. He’s very anti the tendency to bureaucratize and divvy it up into professionalized components with atomised portions of responsibility (but recognises this is harder and harder to defeat, it’s systemic, and a trend common to society generally). Similarly, he sees his professional work as indivisible from an ethics of responsibility. A frequent lament is the way that bureaucracy and professional norms de-responsibilize us as people and citizens. To the issue of making buildings accessible to wheelchair-users, for example, he responds caustically “When we’ve made everything accessible with ramps, we’ll be happier because we won’t be obliged to think any further about disabled people and the difficulties of their existence.” (p. 200) Instead, we should recognise that when it comes to using space, “we are all, in a way disabled” (p. 201) and we need therefore to think beyond technical solutions to problems narrowly defined and work against the political and structural problems that inhibit people’s lives. For De Carlo, highly formalised practices – even more so when codified and the authority of the state has imposed legislative power on them – make us more stupid, and the original purpose for the codification is lost: the letter of the law or principle involved may be followed but its spirit disappears. There’s a lot of cross-over with James C. Scott’s argument (1998) that people’s on-the-ground, specific, practical skills and knowledge, what Scott calls mētis, is too readily dismissed in favour of simplification and more formal, apparently generalisable knowledge. The book illustrates an inclusive pacifist with democratic ideals buried into the heart of his work: “I’m looking for an architecture that involves everyone because architecture itself is involved with everybody … I want it to return to being the first point of reference in what it means to be human in physical and social space, an architecture you can’t ignore because everyone’s involved with its creation, people can’t do anything but be part of its creation.” (p. 252) His anarchism has a soft, humanistic care for people, for education, for young people and a recurring demand for humility. Not enjoying the power plays in university, he nevertheless taught there (Venice then Genoa) to “understand young people’s new openings onto a world that’s changing” (p. 249). Research, thinking, learning and talking about architecture – who it involves and the histories it involves – is central to his practice of it. The focus on learning – intellectually and professionally – is strong but is based on discussing with and learning from colleagues outside of formal institutions whether the university or professional associations, especially in the late 40s. Talk features heavily as a form of learning in a way that was integrated with his social circle in Milan – principally other architects, artists and writers. There’s so much more: quite a bit on Team 10, his relationship with Aldo van Eyck in particular; strong critique of postmodernism and architecture hiding out in the academy; meeting other anarchists interested in both education and architecture such as Colin Ward who he thought extremely highly of. As someone still relatively new to thinking about architecture, what struck me most was his conception of it, an ontology that’s so different from the media-presented images of glorious buildings. His is an architecture that can’t ever really be settled, it’s on-going because people are part of what it is and so it’s therefore always subject to change, it can’t be owned or definitively represented. I’ve always enjoyed reading interviews with people as a way to learning about what they think. I’m not sure whether it’s the immediacy of the conversations, whether you can ‘hear’ them think in a way that’s much easier compared with thoughts wrestled on to the page in the more literary exercise of writing or simply the greater informality of the interview context. Here, the interview format really works, the flow and provocation between the two, De Carlo and Bunčuga, acts to bring you in to their world, to feel as though you have the privilege of sitting, listening and learning from two very keen thinkers. It’s a brilliant book and superbly edited with the passing of time providing the main narrative but plenty of loops back to moments and ideas that benefit from more fleshing out or a different take on things. Why/How to Build School Buildings (article, 1969) by De Carlo is one of the most provocative, intellectually engaged essays that crosses education, schooling, society and space I’ve read. The demand posed: why we’re building schools in particular ways (rather than simply working on how they should be built ) is a question that isn’t asked enough. Architecture is too Important to Leave to the Architects: A conversation with Giancarlo De Carlo (2005) by Roemer van Toorn and Ole Bouman. The Spatial Agency site also has useful notes on De Carlo’s practice and legacy with many good references. Un tributo a Giancarlo De Carlo A Venezia (article, 2016, Italian) by Francesco Samassa is especially good on his time teaching in Venice. Pen Portrait: Giancarlo De Carlo (1919-2005) (article, 2014, English) by Britt Eversole in the Architectural Review focuses on his reputation and interests in participation and teaching. This links to the Giancarlo De Carlo Archive at IUAV, Venice with a pdf that lists the types of materials they hold as well as a very thorough biography.